1. Lex Luthor is a street art fan/ collector. He has a banksy shirt and cleon peterson paintings. 3. Lois Lane uses Olay but Diana Prince has the fountain of youth. 4.The Bat Mobile looks like a Tamiya Black Saber. I like Nolan's Tumbler. 5. I'm not comfortable with Neil deGrasse Tyson taking about aliens; I think Giorgio A. Tsoukalos from Ancient Aliens is better. 6. Superman can hear whispers but Batman used a high wattage cloud breaker in calling the former. 7. Barry Allen looks like an Asian? I'm not sure. 8. Aquaman transformed from a Dothraki horse to a Dothraki fish. 9. Batman is Newtonian while Superman is Einsteinian physics. and I am not ready for a Ray Palmer physics. 10. Matt Murdock is Bruce Wayne with glowing cat eyes and with guns in his dreams. You cant talk peace and have a gun right?..Francis M.
11. The Batcave looks like an aquarium and I like it. 12. Do I hate or love the movie? 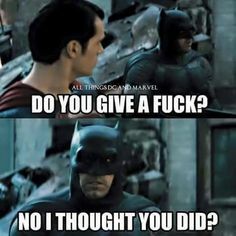 Well according to Martha Kent " People hate what they dont understand." but We are on a "democracy" and according to senator Finch "democracy is conversational, not unilateral"
PS. Bearing number 12 in mind, email us your thoughts and we'll check if you bleed. Lol. No seriously, email us and let's have fun chatting up BvS and art and what-not together.